Noam: Yes, yes, I remember that. Linda: First off, I just want to say how much I love you. Our correspondence over the years has been such an inspiration to me. BTW, how is your “pseudo grandson,” as you call him, Ernesto? Noam: Oh thank you, that’s a nice way to start. He’s doing fine. I just saw him this weekend, coming up to his third birthday… It was pretty nice weather, so we went out for a walk in the woods. He had a ball climbing rocks. Lovely, little kid. It’s interesting with his mother, and his aunt. These are young women who grew up in villages in Guatemala; by the time they were four years old, they were adults, working in agriculture, climbing trees to pick avocados. As soon as we get out in the woods, they start acting like children, and climbing the trees, you know, climbing boulders, jumping around. Ernesto with them, of course. It was fun to watch. Linda: Oh, nice! So you were all together? Noam: …Yes, there are some nice pictures that one of them took; the girls on top of a big boulder and Ernesto on the boulder. Linda: Noam, there are so many things I want to ask you. For example, I have a friend, Christen Lien is her name, she’s a tremendous musician, and she’s just created an album called Elpis. Elpis is the last of the evils in Pandora’s box. The Greeks translated Elpis as hope. Noam: What is it about? Linda: And they are. You know, there’s this spirit that we need to have, which we call “hope.” But I’d like you to dwell on that for a minute with me. If the Greeks thought it was the heaviest evil in Pandora’s Box, how can we come to terms with this idea of hope? Do you have some thoughts on that? Noam: Well, the easiest way to do it is kind of like what I just described. Go out in the woods with a lovely three-year old kid and his mother and his aunt, who escaped from hideous atrocities. These are refugees. They’re Mayan, so they’re refugees from the genocide in the highlands in the early eighties. Everything was destroyed; people are still fleeing. It was very courageous—the mother of this kid crossed the border, I think, seven times…She was picked up the last time, and she was pregnant the whole time. She finally made it through, in her seventh month of pregnancy. I don’t have to describe to you what a border crossing is like. Solidarity workers who have hope, wonderful people in Tucson, you may know some of them, who roam the desert, illegally in fact, because they try to pick up stragglers, or leave water bottles, and so on –they managed to get her, to find her. She had a sister here, in Boston, so they got her here, and when she moved in with her sister, the landlady kicked them both out, so they’ve been living with my daughter, and Ernesto was born here while they were living with my daughter. But anyway, when you watch these people, and you just think of the—I mean you look at this little kid, of course he’s happy, he doesn’t know what’s happening — but there’s a shadow hanging over him. I mean his mother could be picked up any minute and be sent back to Guatemala. He’d go with her and grow up in miserable poverty in Guatemala, or would never see her again. All of this is right over their heads, but they’re happy, and cheerful, and looking forward to the future. Many things like this, you can duplicate them all over the world, and they’re signs of hope. In fact, if you look at what—it’s kind of a remarkable situation now—but if you take a look at what indigenous people, tribal societies, first nations, what they’re doing all over the world, it’s pretty spectacular. I mean they’re the only ones who are making a serious effort to try to avert major catastrophes that are looming — like environmental catastrophes. They’re actually trying to do something about it. Now, we’re doing the opposite. So, you want to have hope, look at people who are struggling and achieving. You can always find them. Linda: It’s a beautiful definition of hope, this story. But do you honestly think there’s much hope for this world, as it is? Noam: No, but you can’t give up. I mean, objectively speaking if I try to be completely objective, if I forget about caring about people and the world and so on, then we’re just racing towards disaster, eyes open, going as fast as we can. In fact it’s rather striking to compare the poorest, least developed, least educated, what are called the “primitive” societies of the world, and the richest, most powerful, most educated countries of the world, and at the poorer end, you have what I just described. 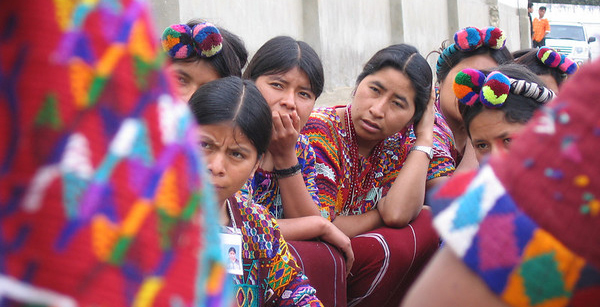 Ecuador has a large indigenous population, enough to influence policy. And one of the policy efforts in Ecuador is to try to gain support from the wealthy countries to keep their oil in the ground. They’re a big oil exporter. Keep it in the ground, where it ought to be: that’s Ecuador. Indigenous population. You go up north, to Canada, and the United States, the richest countries, ever—they’re putting every effort into extracting every drop of hydrocarbons out of the ground and using it as fast as possible. And are lauding the possibility, are euphoric at the possibility, of a century of energy independence, while busy accelerating the destruction of the world. If ever a future historian is looking back at this moment, he or she would think the species is insane. Linda: Well we could be! This morning, I was ruminating about death and asking you what you think happens when we die. For me, spirituality is so deeply rooted in nature, and everything has its life, its lifetime. And I’m thinking, well maybe we’re just part of this, too. We Homo sapiens, we have a life span, and maybe that’s what we’re doing. Noam: I wrote about this once. There’s a great biologist Ernst Mayr, died recently, about a hundred years old, he was a grand old man of American biology. He once wrote an article, in which he basically argued that intelligence is a kind of lethal mutation. He looked at it as biologist. You ask about the biological success of various species, and the ones who do very well are things like bacteria, which mutate very quickly and adapt to changing circumstances. Or beetles, which are all over the place, they have a fixed ecological niche, they can’t survive anywhere else. They stick to it, and they make out. But as you move up the scale of intelligence, to mammals, primates, Homo sapiens, you find less and less biological success. That’s why there are very few apes around. Humans look like an exception, but that’s only in the last few thousand years. Go back to ninety-five percent of Homo sapiens’ history, we were scattered bands of hunter-gatherers. He points out just what you said, that the average life span of a species is about a hundred thousand years, and that’s roughly what homosapiens are approaching. So we may be following that unpleasant natural law which says we have achieved the capacity to destroy ourselves, so let’s go ahead and do it. Noam: But I do have hope, because you have to have hope. Otherwise you wouldn’t do anything, to try to carry things forward. And there’s always a chance, you know. You asked the question objectively, do I think there’s hope. Objectively probably not. But it doesn’t follow that we have to give up hope, we don’t know. Linda: Are you afraid of dying? Linda: If you could go back, if you were let’s say thirty, or twenty again, what would you invest your life energy in right now? 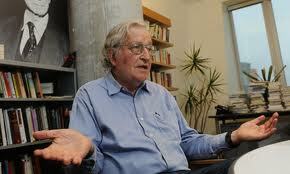 Noam: I don’t know about you, but when I was twenty, or even thirty, I didn’t really think about it much. I just did what I thought I oughta do. Linda: Get married, and have children? Noam: Not even that, just anything. 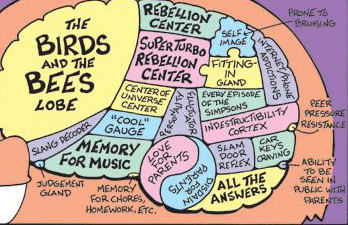 Now first of all there’s an interesting fact about the male brain which is relevant. The male brain matures rather late. The female brain matures at maybe eighteen or so. The male brain doesn’t mature about until mid-twenties. In fact in some countries like Canada they’re thinking of treating young men in their early twenties as juveniles, because that’s basically what they are. But one of the aspects of that is that you just don’t think about risk. I mean I can remember it myself, and I can see it with my children and grandchildren. Just do anything, because you’re invulnerable, you don’t have to think about the future. I didn’t think about it much, I just did the things I wanted to do. In fact I already was married, by the time I was twenty, and I didn’t think much about planning for the future. In fact I had no academic prospects. I was working, and it’s kind of an accident that I’m in the academic world. I was working, developing an area that actually didn’t exist, there was no academic—but it never bothered me much, I figured I’ll do something or other. The same with the political activity. I was very active about doing things I felt oughta be done. Noam: I like the guys who made the movie, they’re friends, but they were just following me around. If I got off an airplane, you know…like some kind of celebrity. I’m not a celebrity. Noam: Like these indigenous people in Ecuador, for example. They’re really doing something. Who knows who they are? Linda: So with young people today, my question is, where would you put your energy now, in what arena? I mean would you go to Ecuador, would you work with the Ecuadorians—? Noam: The most important place to be is the United States. For one thing I’d stay here because it’s where my attachments and everything else are, but just objectively it’s the most important place to be. Because what happens here is going to be much more influential in the whole world than what happens elsewhere. Very important things happen elsewhere, it’s not that the United States runs the world, but you look at the degree of influence and power, although U.S. power is declining, has been for a long time, it’s still incomparable and will be for a long time to come. For example, take almost anything that’s happening. There was an international conference recently, and they general assembly reached a small arms treaty. Well that’s kind of important, you know. Tens of thousands are being slaughtered all over the world from small arms exports. In Mexico alone, most of the deaths come from guns from the United States, which incidentally wouldn’t be affected by the treaty. But the small arms treaty is important. Will it have any effect? Not if the United States doesn’t sign it. And it’s very likely that the U.S. won’t sign it. That’s one example, but you can proliferate them enormously. So the most important thing that can be done right now are changes within the United States. Noam: Ah, sort of. I mean Massachusetts happens to be a safe state, it’s gonna go Democratic, so I voted for Jill Stein, Green candidate, nice person. But if I had been in a swing state, I would have held my nose and voted for Obama because the alternative was—you know I don’t like him and his associates, the alternative was much worse. These things make a difference. Given U.S. power, it makes a difference whether say, if Bush was in office or Gore. Linda: Thank you so much for speaking with me today, Noam. We’ll talk again soon, I’m sure. Best wishes to everyone. I hope you and Ernesto liked the cookies. Noam: Yes, Cookies don’t last long here in the office! Yelapa Mexico, Edward Snowden, Noam Chomsky, and the benefits of Kraut! Lilly: Hi Linda, welcome back from Mexico. How was the women’s retreat? Linda: Fantastic. It was the best retreat yet. There were 9 of us, a full house. A mother and daughter, who have come three times, already signed up for next year. They consider it a yearly “tune-up” for their relationship! For me, it’s an opportunity to feel very free, in nature, like I was as a young woman. And the nature there makes me euphoric. It is 2nd in biodiversity to the Amazon. Check out this house, Lilly, it belongs to Claudia Brown. 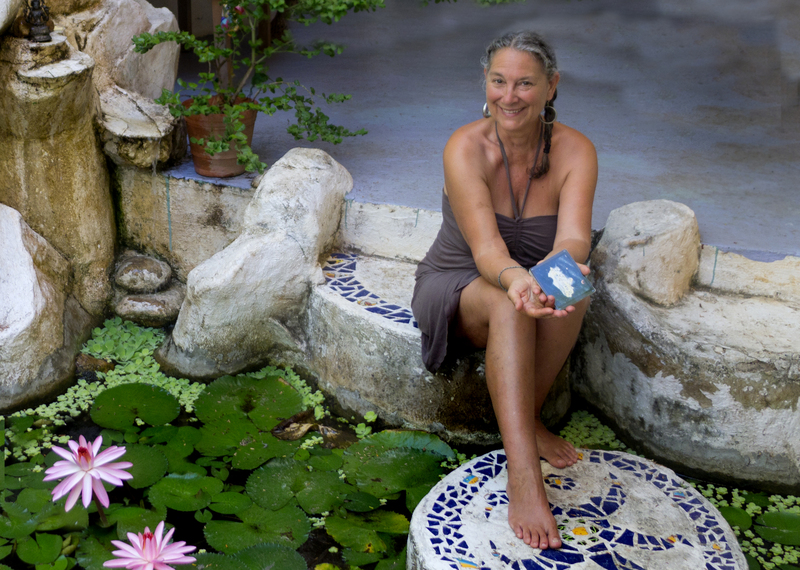 She’s a massage therapist, a tropical garden gardener, has a bird sanctuary, and makes the most beautiful jewelry – lives in Yelapa full time. This lily pond is inside the house! Lilly: Wow! Remind me where the retreat takes place? Linda: In Yelapa, Mexico, a fishing village. Kellie Shannon Elliott (who will come next year again) led 5Rhythms dance each morning; we met in circle for a few hours before a late lunch, and later Norma Jean Young, a great Reiki Master, led us in relaxation in the late afternoons. The thing I love the most about Yelapa is feeling of sun, the air on my skin, the sound of the waves 24/7, and that we get to swim in some of the most pristine water on the planet – One day, we hiked to this waterfall in another village to swim in a glorious poor. We just strip down and jump in. Here, see these photos. After the waterfall, we go by boat to another little fishing village and have a home cooked lunch with a Mexican family, replete with moonshine and guitars. Lilly: That sound amazing! Well, that’s not the only event that the beginning of summer has in store for TTC, is it? Lilly: I heard you’re invited to be an “elder” this summer at the Generation Waking Up Leadership Training, which is happening in a couple weeks on Whidbey Island, at the Whidbey Institute. By the way, we have an exciting event in the planning stages in September: We’ve been invited by the PBS station in Japan to create a special circle, which will be filmed for a segment of a series on cell biology. This one will be about youth development. I’m intrigued to see what they’re going to be doing. More about that later. We’re going to need some volunteers – so the call is out there. Any teens interested??? Linda: They found us on the Internet. Lilly: Hey, what about that Noam Chomsky interview I just transcribed – when does it come out? And the Joanna Newsom interview from so long ago? Speaking of interviews and just keeping focused on what one person can do, Brenda Starr, star reporter for KHSU, Humboldt State U interviewed me for Through the Eyes of Women. It will be aired Monday, July 8th, at 1:30pm PST and will be streamed on the station website, and on their blog: www.khsuwomen.wordpress.com. I speak not only about TTC, but about my photography, and how both these acts give me a way to express my values. Lilly: I love working here, Linda! Linda: Thank you, Lilly. I love having you here! Linda: Ok, enough work for today – let’s go jump on the trampoline and get outta this office! The sun’s out… can’t miss it while its here, now can we! Oh wait, it just started to rain. Dang! No, wait, it’s back… let’s get outta here!